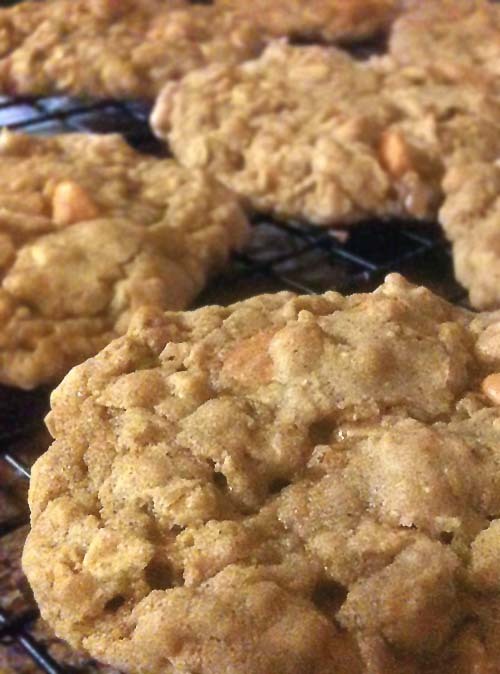 These delicious oatmeal cookies are chewy in the middle from melted butterscotch chips with enough crispiness on the edges to crunch a little when you bite. The recipe is from Laura Vitale's YouTube channel. It's included below. In a large bowl, combine butter and sugar (brown and regular). Cream together with a whisk. Then add eggs and vanilla extract. Continue to mix until well-combined. Then add flour, baking soda, cinnamon and salt. Mix until batter is smooth. Finally, add butterscotch chips and oats. Batter should become doughy, so mix them in a folding motion. Scoop a spoonful of cookie dough ball onto a baking pan lined with wax paper (or use a non-stick baking pan like Laura used in her video). Be sure to leave a couple of inches in between each ball to allow for expansion when baking. Bake for 9-11 minutes until the edges are light and golden brown. Let cool in a rack for 5-10 minutes before serving. Used this video from Laura Vitale for the recipe and instructions. Real easy to follow.